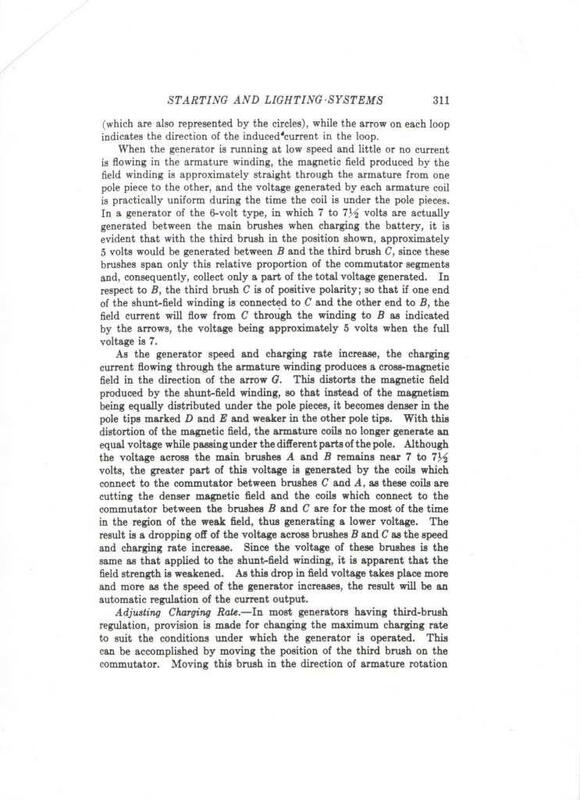 Model T Ford Forum: Details on how Model T generator third brush regulation actually works. Details on how Model T generator third brush regulation actually works. Model T Ford Forum: Forum 2018: Details on how Model T generator third brush regulation actually works. 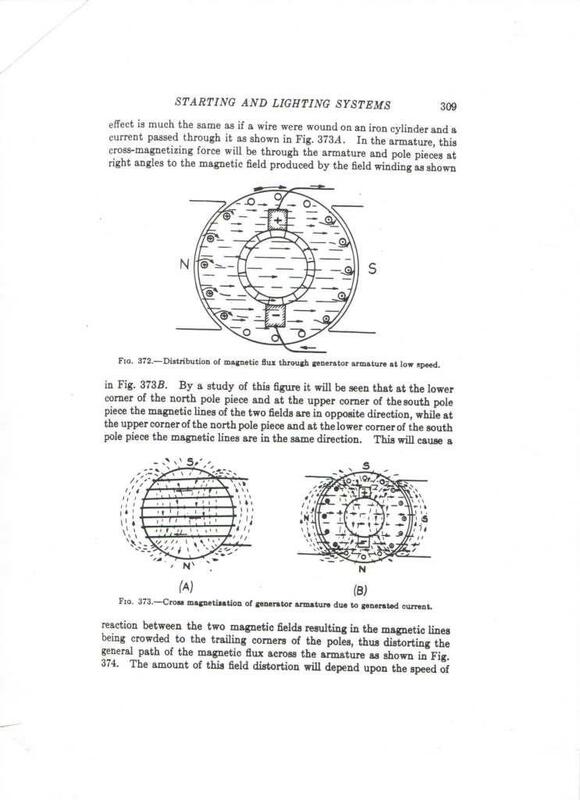 I try to keep my explanations simple so everyone can understand without having an Electrical Engineering degree. 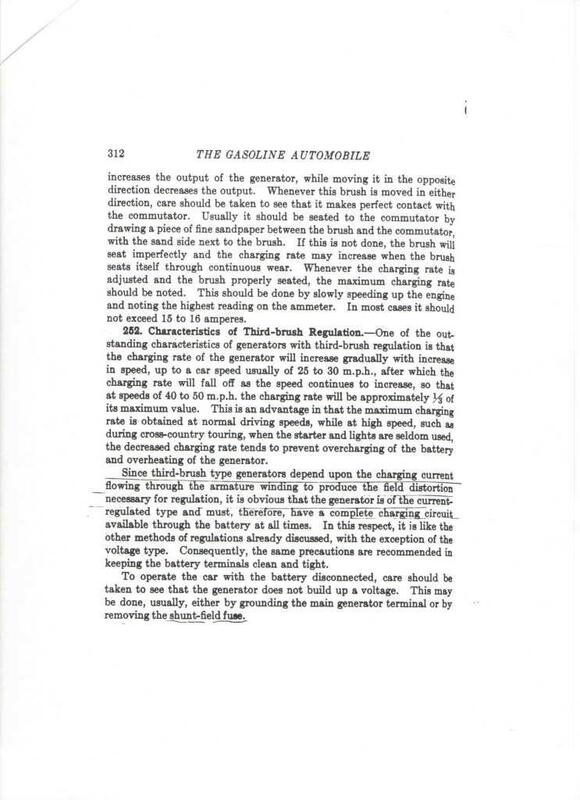 This explanation, taken from a 1924 automobile engineering publication, is very detailed and in some case may not be fully understood. Note the last sentence of the explanation. I have a 26 Fordor that is essentially original, with a 6 Volt negative ground system. It was not charging well, so I bought a rebuilt generator from Lang's, a new cutout (coil type), and new ammeter. The new generator did not work, so I called Lang's and sparked it. No luck. I sent the generator back, and they said the generator worked fine. I re-installed it, and it still did not work. I tightened the brushes, which were all loose, and bent one of the brush leads a little because it appeared to be shorting with the generator casing. Now the battery charges only at very high engine RPM, in Ruckstell low and Ford high with the car going as fast as I dare go. I am getting about 0.5 Volts at the generator terminal at high RPM with the car in neutral and the third brush outboard (to right) as far as possible. Third brush in opposite position seems to work better - I get two or three amps of charging at high speed. Ammeter shows discharge when lights on and engine on or off, slow speed or high irrespective of third brush setting. I have never produced enough amperage to keep the lights on without discharging the battery. The battery seems fine. I charge it with a 6 Volt charger every couple of weeks. The car starts like a dream, even when cold. All wiring looks good and seems to be terminated per original drawings, including at the ignition switch. I run on magneto typically, even when cranking. It works better, so there is no draw on the battery when I run during the day. I would like to operate with headlights on at all times, but cannot. Please explain what you did when you "tightened all brushes, which were all loose". The coil type cutouts are bad news if they are the cheap import ones. Your description of which way you moved the 3rd brush has me wondering. Here is a better way to tell us what you are doing on that. With the third brush mechanism rotated in the SAME DIRECTION that the generator normally spins you then get MORE OUTPUT. Rotating the third brush the opposite direction that the armature is spinning will reduce the output. If you moved the main brush assembly for whatever reason then you probably screwed up the main brush "neutral point setting" and that can greatly affect the third brush setting making it impossible to get much current out or in the other extreme causing it to put out way too much. Correct setting of the third brush will usually be somewhere around the midpoint of the mechanical range. If it is somewhere else then the generator's main brush is probably not at the neutral point. Generators do not put out at idle but they can only keep up with the headlight draw when you are at high RPM making it sometimes difficult to have the battery not go down a bit if you do a lot of stop and go driving with the lights on - Cutout does nothing to add or reduce the amount of charging. It just makes charging possible when the RPM is high enough and disconnects the generator at LOW RPM when the generator would in fact load down the battery as the battery would try to spin the generator as a motor. It is a simple system that requires the generator charge adjusted to equal your normal driving but it may prove difficult to drive with the headlights on all the time. Not many if any of us do that. Most of us don't drive our T's at night unless on a large tour with a lot of other antique cars along the column. I did not mention that this is my first Model T. I bought it from my uncle last October. He owned it from 1950 until his doctor told him he couldn't drive it anymore in 2017 when he was 89, so it has been in the family for 68 years. The brushes are mounted in zinc cast housings, and the housings were wiggly. I tightened the nuts that hold them in place. I did it several weeks ago, but believe I tightened both of the main mounting assemblies. Two of the brushes are in fixed positions, and one is on a slot that allows for adjustment. I am assuming that the slotted mount is the third brush. I do not know the direction of rotation, but the third brush is on the top of the generator and is as far from the engine as possible. So the generator driving gear is forward and the third brush is as far to the right (car right) as it can go. Car right and left is generally such that the driver side is left since car left and car right are assumed to be left and right as the driver sits in the car. Based upon that - you have the third brush then fully retarded when you have it as far right as possible and in that position you should get zero charge. If the main brush assembly was loose then it may not be in a neutral position when you then tightened up its mounting. That could be at least part of your problem. I suggest you get the MTFCA electrical manual and read up on it before you go further. Take John's advice. Buy the book. If you were able to get to the brush holders, the assembly would have had to be removed from the rear housing. If that is the case, your "null" is certainly out of adjustment, as well as the 3rd brush holder (by your description). A careful reading of the book will put you back to where you want to be, and you'll have a valuable new resource for your T library, to boot. Welcome to the hobby! And know that not all repairs to your car will be as frustrating as this has been. In general the output of the generator increases with increasing RPM. 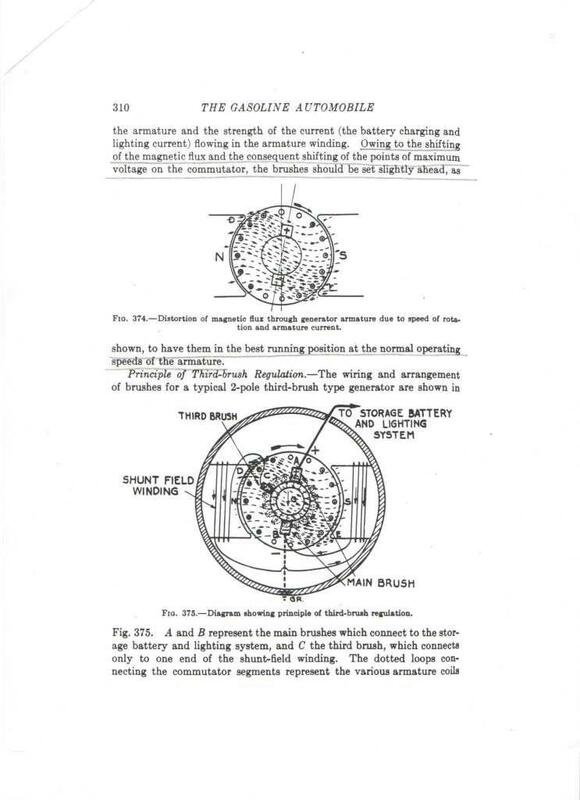 The point of maximum voltage on the commutator shifts as the generator RPM increases. The third brush, which supplies current to the field windings, is located so that the point of maximum voltage moves away from the third brush as the RPM increases, thus reducing the current. The generator is then self regulating with the peak current being somewhere in the middle between low RPM and high RPM. 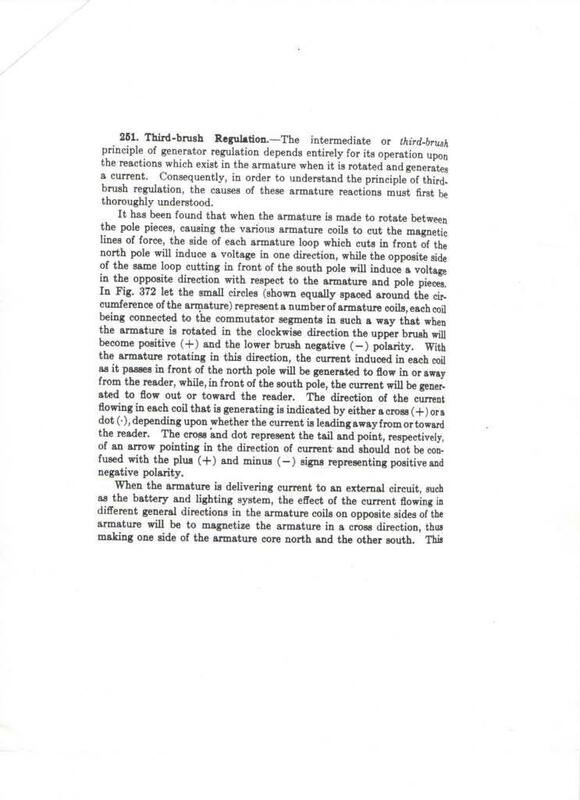 Moving the third brush will change the maximum current. It should be moved at night when you have your head lights on so that the battery does not discharge and then moved back when driving with the head lights off so the battery does not over charge. Thank you, all. I will follow your advice regarding the book. Yes, this has been a little frustrating, but the Model T is a joy. I have learned a lot in this forum and from all of you.